One of the most fun and popular prop hires available is popcorn machines. 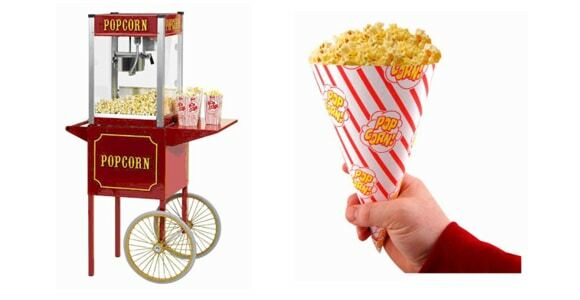 Setting up an old-fashioned customised popcorn machine in your lobby that is brimming with warm, buttery popcorn creates an atmosphere that is inviting, fun and personable! The cost of producing delicious popcorn is so inexpensive that it is the ideal prop hire treat to give away for free as a thank you to all of your staff or customers. *Price shown applies to machines collected from our shop only.